The fog was a heavy blanket as we drove out of Great Falls and turned onto King’s Hill highway. We had to either believe in the road or get out and walk. On-coming cars emerged from the brilliant white veil, first with the faint yellow glow of headlights and then immediately the whole vehicle rolling past. Everyone trusted in the rules of the road and drove on. Eventually we dropped below the cloud layer into a luminescent undersea where the fog above us and the snow around us seemed nearly the same. Weather is not a garnish in Montana. It ever-changes and surprises. While we are not 100% dependent on the weather as our ranching friends and family, the weather affects our everyday. We left the fog on the North side of King’s Hill. Driving into the Musselshell valley, high white clouds dappled the blue sky. We’d only been gone a day, but the snow melt was visible. Patches of parchment colored grass blotching the white. The edges of Lake Sutherlin were rimmed by blue melt - a color that evades description. Baby blue, sky blue, tiffany blue, powder blue, ice blue - perhaps Celeste Pallido. But not even pale heavenly blue accurately describe the blue of fresh ice melt, a color that defies its undoubted frosty temperature. I want to venture into its celestial depths just to be surrounded by that shade. At the very least, I want to paint my car, my eye lids, my fingernails this magic color. I imagine I might be able to find it in my paint box, at the same time knowing it cannot be captured. Robert MacFarlane spent years collecting terms to describe landscape, in the belief that what we don’t describe in detail, we haven’t really seen. In the introduction to his collection he describes the Northhamptonshire dialect meaning of ‘to thaw” as “to un-give.” Montana is in a state of thaw. It is typical to the time of year, but something I haven’t experienced before. I have tried to see the “un-giving” of the process. Surely the whiteness, the thickness of drifts, the hiding of features is being taken away by melt. But there is also a quality of giving to the thaw as the resulting water saturates the ground either in a nourishing way or as a destructive flood. Giving? Ungiving? Sustaining? Destroying? When we turned off the highway for home, I hoped that the river would still be ice covered at the bridge. I wanted the picture, that I had not yet taken. But I suspected the ice would have already melted. Nothing prepared me for what we saw. I have never seen an ice run. And now I am stuck with MacFarlane’s charge to find the words to describe it. The ice lay in chunks piled across the river creating an ice jam. It was an architectural ruin, remnants of something that had been constructed, but failed. I snapped photos on my iPhone. Made inarticulate pronouncements, like “oh wow” to our neighbors who also gathered at the bridge. The ice was still, having found a place of stasis between the acting force of water and the resisting force of the bank as I have now learned from reading about the process. Our neighbors, who have experienced this many times before, pointed upstream to a raft of broken ice plates coming toward the bridge where we stood. Before the first piece of ice hit the jam at the bridge, the increase in current that comes with approaching ice, flowed under the jam and dislodged it. All of the ruin, the accumulation of ice rubble, was suddenly free. And then the new slabs hit. The entire channel was in motion, ice blocks sucked under the water or rising up out of the current. The current rushed and splashed while the blocks cracked into each other. I was sure the river would be clear of ice in just a few minutes, but just as quickly as the breakup began, it found a new configuration and stopped, leaving ice slabs tilted and piled up as high as four feet above water level. All seemed to be in stasis again. If the weather held, the ice would continue to degrade, the flow would accelerate, more ice rafts would come downstream and something would break loose again. It was hard to leave the bridge. Was it a fascination for wreckage? Or more likely, a pull of baring witness to natural forces, things that are not in our control and remind us of our place in the system. I know our neighbors are moving their cows today. The river is too volatile for the animals to remain in the adjoining pasture. While they work to protect their livelihood, I am wrestling with words to describe a shade of blue and the sound of ice hitting ice. 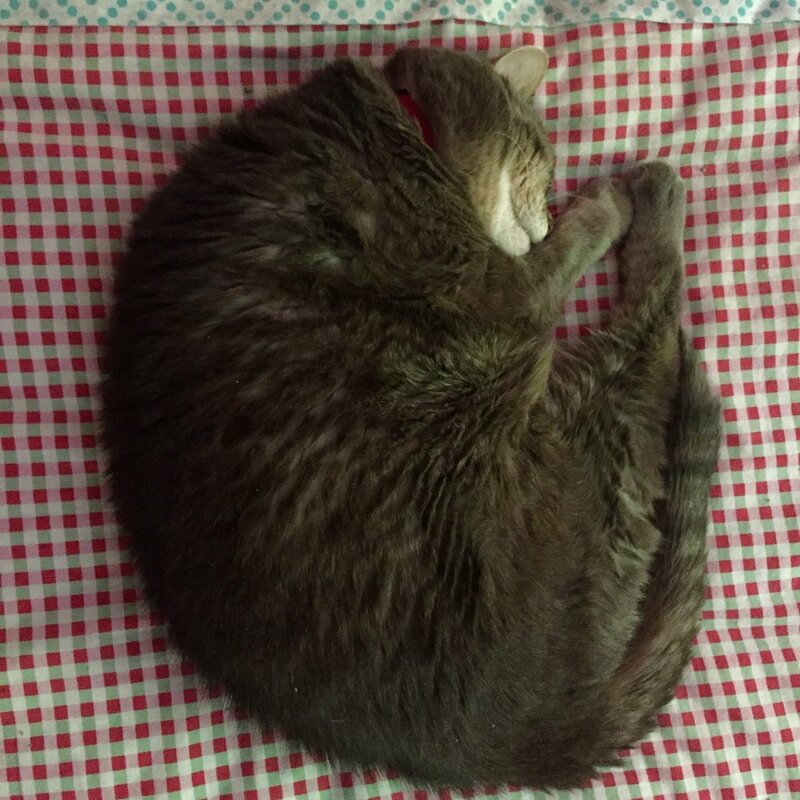 On a recent morning, while laying very still, I heard my old cat’s regular snoring and was momentarily confused as to whether the sound came from her or from me. She sleeps most of the day and I’ve grown accustom to the faint wheezing of air through old nostrils while I wrestle with words at the computer. We’ve grown old together, my cat and me, she accelerating at a faster pace. I was nearly 50 when she was a kitten, but now I think she might be beginning to pass me up. The arthritic limp I see as she walks across the room is not so pronounced in me. But for just a moment, we seemed to be nearly even keel and I was uncertain who the wheezing came from. Finding all the pieces. A stack of rags is altered by folding, yet doesn’t try to masquerade as anything other than rags. The broken bowl, settled into a depression made by its own shape, is broken precisely in two halves. I thought of gluing it, but found it rested more whole on this humble stack. The days my own, their beginnings defined by a cut lemon: glistening, bright, astringent, sharp-sweet smell, held in a triangle of pitted yellow and white pith. One triangle submerged into hot water, an old lady’s drink. I am not embarrassed, have no regrets. I relish the warmth and brightness. The comfort of habit. An anchor in the vast sea of an open day. Coffee will come later with its oppositeness of color and smell and its sameness of something to be counted on. In between these two drinks, before and after their footing, are the words: read, written, and sometimes spoken aloud just to hear the shape of their sounds. here = there is the chronicle of a placed longed for becoming a place inhabited. Following are selections from the last two years of documenting daily experience on dated postcards. The date images were captured each morning in Two Dot and registered by hand in ink and coffee as the sunlight traversed through a stencil. It is a marriage of precision and in-precision, control and control given away. The postcards were mailed to anyone who asked for them and to some who didn’t. Today sun in the morning, as if to say “Don’t go.” But we persevere with our to-do lists, the tasks before we pack and leave. The sun emerges around the house / stands in the middle of the road / and breathes on us with its red blast. / Innsbruck must I leave you. But tomorrow there will be a glowing sun /in the half-dead grey forest \ where we have to work and live. A hundred starlings flying around the house disturbed my dreams, pulling me up from sleep's depth with their swirling. It is impossible not to think of Hitchcock’s birds. It is impossible not to want to get out of here. Starlings have claimed the mornings but in the evening a reasonable flock of yellow warblers and a few red-winged black birds perched in the choke-cherries across the road. Occasionally some collective signal lifts them from the branches and then they settle back down again... maybe spreading to the nearby fence wires... never swarming or threatening. Wild swings govern my days. The desire to go home suddenly swirls around me, overwhelming... a flock of starlings lifting from the ground at once in a clatter of wing flapping without indication of their unison direction. Both cause me to duck, hoping to avoid collision. Other times of day are not governed by sudden movements; the rhythm of work setting a tone. It is not complete stillness but movement back and forth with small rises of energy. In these times I am saturated with the desire to continue, as content as the warblers on the fence. But I am imagining that even the warblers must be feeling the urge to re-locate given the hint of winter in the morning chill. This summer’s twilight is made of smoke. We turn the lights on in the morning to alleviate the dim. Last night was restless and full of coughing. and now the view out the windows is hazed like an ancient oil painting. One window, if I tilt my head just right, holds a classic landscape with a proscenium made of a ripening hay field, trees as curtains on either side. Layers of hills grow progressively soft as they recede. “All the world’s a stage.” There is meaning in the setting as opposed to the action. John and I will be in the schoolhouse a little longer, but the summer has begun to transition to memories. Guests have moved in and out of the guest bed. At first, Angie who slept downstairs with Jessica but couldn’t keep her eyes from the bed upstairs, not having Jessica’s pension for dark places. Erin removed everything extraneous from the bed. “I am a one pillow girl,” but arranged pillows and a blanket on the floor for meditation. Sara Ann stayed in the schoolhouse alone and in the cavern of the empty rooms, she stripped the bed of all but the sheet and wrapped herself in her own familiar sleeping bag. Alaina made the bed everyday precisely as she found it, but hung her dresses around the room wearing something new everyday. Yvonne was here only one night, but she did not sleep till morning, having a headache that would not give way in the dark. She slept with intense dreams that we discussed later over coffee. Jim made the bed his home for four days, sleeping through the affects of vertigo. Sleep was his only refuge until the world stopped spinning. Lynnette checked on him regularly and joined him at night.... always worried until he was able to stand and we all went to Crystal Lake. Little Ben was the last to sleep in our guest bed. He made the room his own, stacking his clothes, pulling over a little school desk for “work,” arranging all the toys from the house around the bed. His favorite stuffed dog that came in his back pack settled onto the pillows. The first night during a thunder storm, his dad found him sitting upright and crawled in beside him to alleviate the noise and light. To my delight, each morning when he crawled out of the guest bed, he came to me for a hug. All of these stories have become part of the schoolhouse. Silence is a jealous lover. You court her and get to know her secrets. You find pleasure in her company and she stays with you. But if you ignore her... say in the throws of a house full of people with dinners every night and lingering coffee breakfasts... she is hard to live with again. Sitting at my table drawing alone, the ache of every departure having lessened, I finally noticed the silence again. The silence that is never silent. Two fresh fir cones, collected on a walk with our son and grandson, began to pop in the warm studio. And there it was, the silence that is full of what is on the table and in the air. We went to the mountains for the Perseids. We went to the mountains to get away. We went to the mountains to be still. Sitting in chairs we’d carried into the middle of the park, we watched the sun go down and the surrounding trees turn to shadows. We had nothing better to do than sit still and wait. Eventually the stars began to appear, first one and then another until the sky was littered with points of light. Early in the night for a meteor shower, the stars remained still. It was an owl who broke the stillness, repeatedly swooping closer and closer. Owls are famed for sitting still and watching from a perch, but it was us who sat still this night. In the end, it was poor night for the Perseids, We saw only a few meteors before the moon washed the view with too much light, but there was no disappointment.